PictheGift now offers a new Personalized Photo Beach Towel that can be customized using images, text, clip-art, and more. Great for gift giving or customizing towels for the whole family. Available just in time for summer, PictheGift has announced the new addition to their ever growing product line of customized products with their new fully customizable Personalized Beach Towel. The large towel measures 30" x 60" and can be customized on the entire front of the towel using the user friendly PictheGift online designer. The designer allows you to add your favorite image (or images), text, or design and then customize further with the option of using different effects and boarders for a truly one of a kind design. The beach towel is made from a heavy duty 50/50 poly/cotton blend perfect for absorbing moisture and soft for cuddling up and drying off. The unique image infusion process leaves the product with a vibrant and beautiful image that can be treasured for years to come. The towel can be used for a day at the beach, pool, lake, and more. Great for giving as a gift or customizing towels for the whole family. As a company with a leadership team that has over 50 years of experience within the manufacturing and distribution of personalized gifts industry, PictheGift is committed to bringing customers affordable, personalized gifts. The PictheGift manufacturing facility is centrally located in St. Louis, Missouri so that they are able to offer expedited delivery to their clients and ensure products are shipped anywhere in the U.S. in less than four days. All manufacturing is done in the United States to support American jobs and the American economy. PictheGift offers products for personal and commercial use. 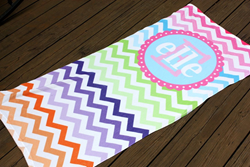 For more information on PictheGift, their Personalized Beach Towel, or other products, visit http://www.picthegift.com.